Hello my lovelies! It seems that every Monday Blues post I complain about the weather. I can't help it though because it's absolutely freezing outside. It feels more like winter even though it's just the beginning of October. I also heard that we have an extremely cold winter ahead of us, which makes me sad because cold is not my cup of tea, even though I'm a December baby. 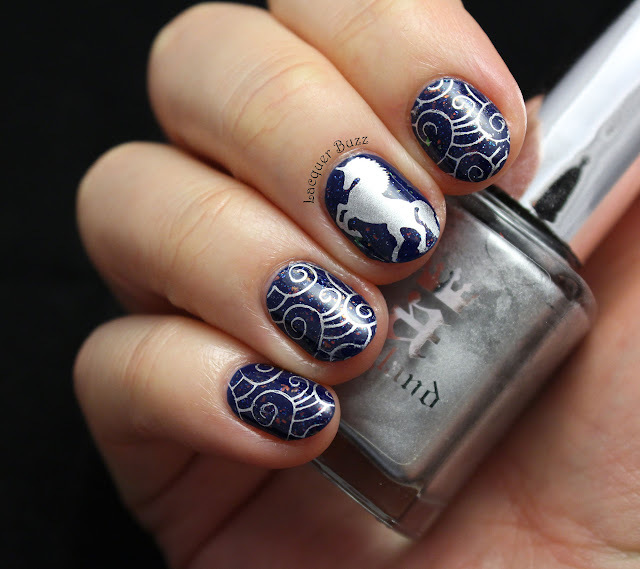 Anyway, today's post continues the series of fall inspired manicures. Whenever I think of fall nails I think of flakies, probably because they resemble fallen leaves. 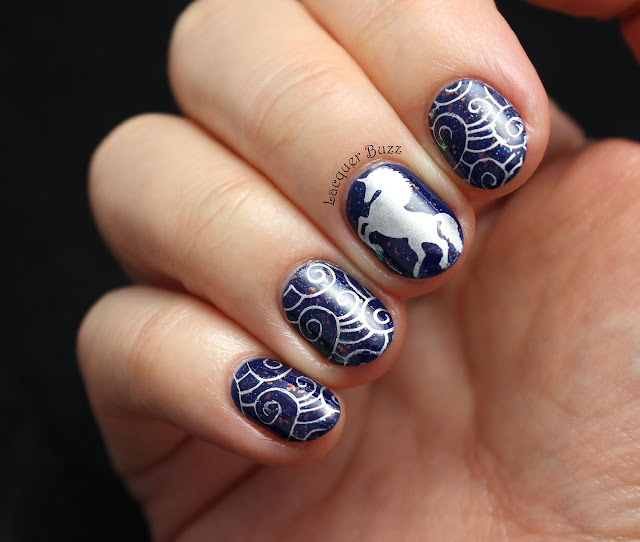 Today's manicure is all about flakies and a bit of nostalgia. Here we go! 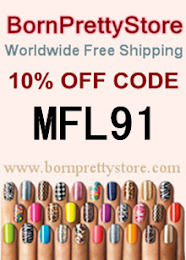 Do you remember when there were no indie polishes and people used to make their own combinations and call them frankens? Well, the polish you can see on my nails is one of those frankens. It was designed by the talented Swatchaholic and is called Waking Up at Midnight. It was sent to me by another talented nail enthusiast named Chiro, who was kind enough to make me a bottle. I still own and cherish that bottle, even if I haven't used it in a long time. But now it's on my nails again. I absolutely love it! 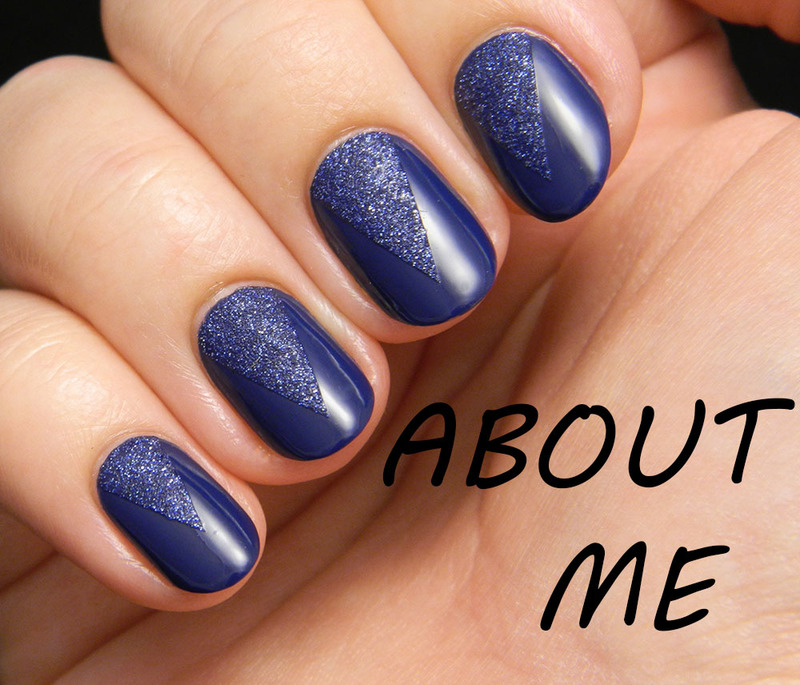 Waking Up at Midnight is a jelly, so it requires multiple coats to be opaque. 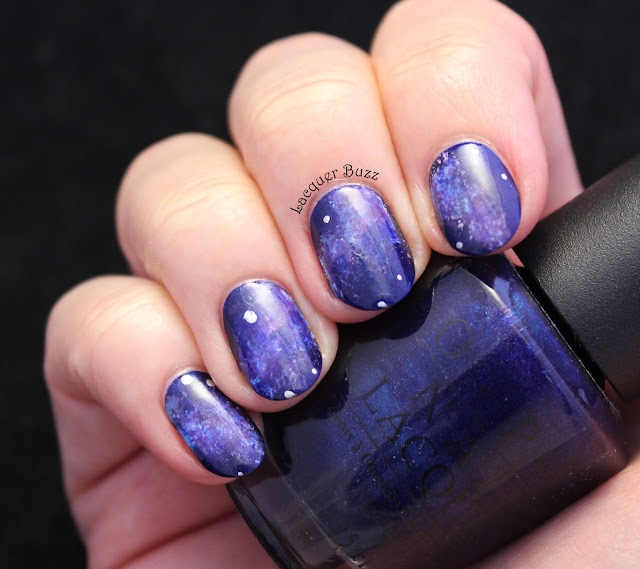 I used a coat of China Glaze First Mate as underwear and only used one coat of the jelly on top. 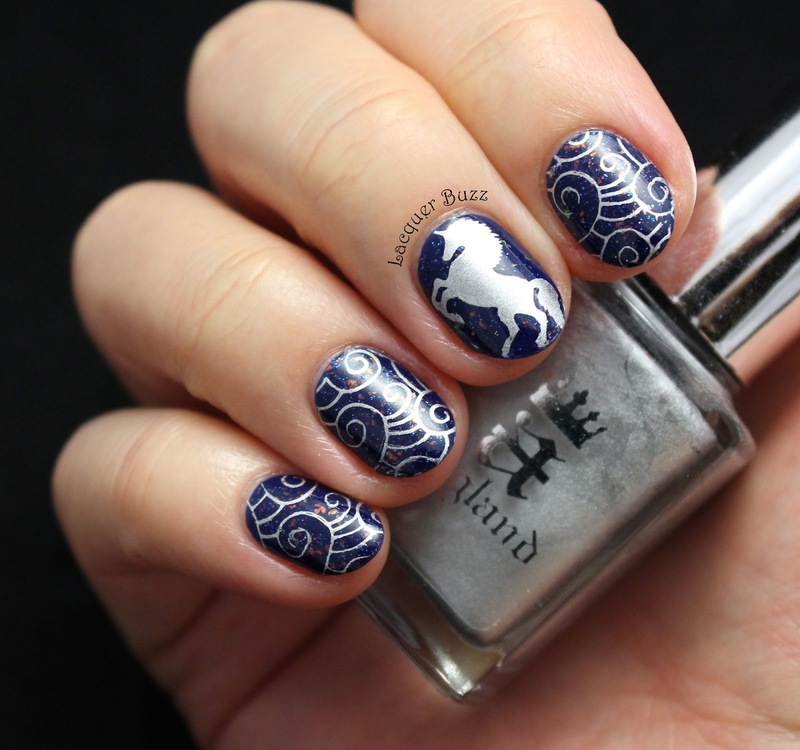 I used Nailz Craze plate NC02 and a-england Excalibur to stamp on top. This plate was also very popular years ago and I can remember how excited I was to order it (along with two other Nailz Craze plates). 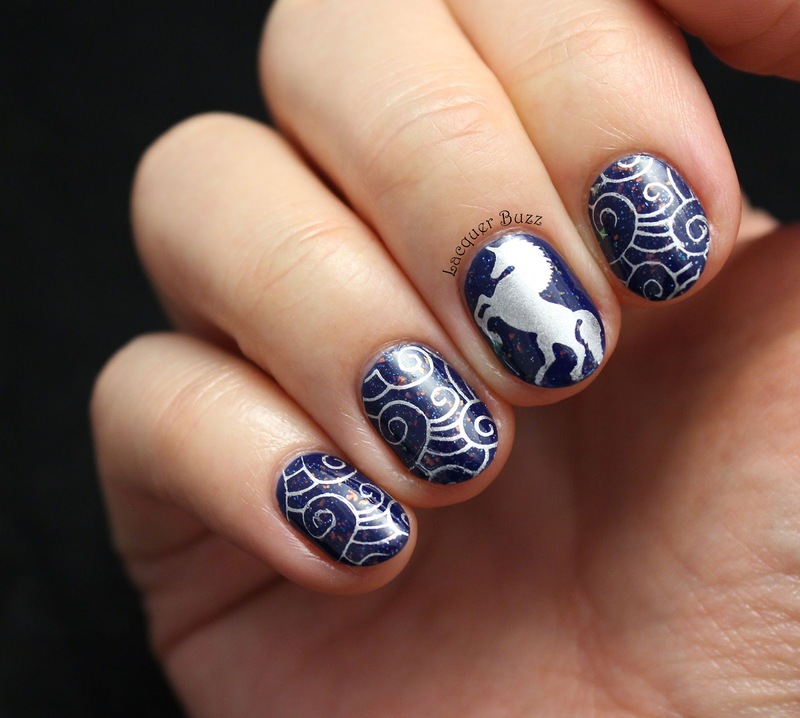 I'm happy to still see people use the unicorn and the Pegasus for their manicures. The plates are still available on Etsy, of course. These nails remind me of the first years when I started doing nail art. I can't help but feel a little nostalgic when I look at them. I hope I will still use these polishes and plates many years from now on. 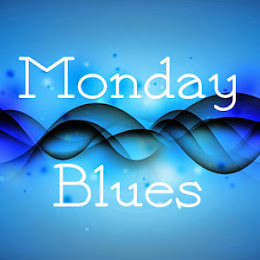 Don't forget that you can check out the rest of today's Monday Blues in the links below!